Several significant questions have been raised as of late about fire and movement. On the forum, Buddy Team Usage was the title of a very good question by Mark9mmp. Many of these questions are also brought up during Combat Team Tactics (CTT) and Combat Patrol (CP), and are brought up repeatedly. The best way to answer many of these questions is with two policies that should both be continuously practiced during fire and movement. What to do when you and your battle buddy are separated by another battle buddy pair because you have each taken cover in opposite directions? Team Integrity is paramount in Small Unit Operations and every attempt should be made to keep teams together. Team integrity is accomplished by being constantly aware of where your buddy and your team is, and what they are doing. SCAN!!! …anyone? Basically it is staying with your battle buddy and with your assigned team. (See post on ‘Buddy Position Awareness‘). Now if your buddy goes the “wrong way” you should always move to stay with him. (unless he is obviously doing something suicidal or incongruent with the mission) Firstly, he may see something you did not, so who are you to say he went “the wrong way”? Secondly, even if he went to the “wrong” side, you both still have a much better chance of coming out victorious if you work together and avoid getting separated. So who decides? Whoever hesitates, follow the other guy. Right or wrong someone has to make a decision, and the other guy has to follow. Which way you go is up to the man who acts first. The other guy has got to follow. Remember too, a bad tactical decision won’t necessarily kill you. Hesitation under fire will. If we are out on patrol and suddenly we are attacked, how do you know to bound forward or bound back? How do we know what to do? There are several answers to this, and all are valid. Alumni will remember that in the CTT and Combat Patrol classes, you will already know if you are advancing, falling back, or maneuvering on the enemy position with a support squad laying down covering fire is based on the drill. The action is pre-determined in the pre-patrol briefing. This is mostly done to focus on teaching basic execution of fire and movement. This however is applicable to the real world. If you have a four man team and you run into unexpected contact, it would be wise to have a standing order to break contact every time since you are a small force. The other way is the Combat Estimate, and this is done by the unit’s tactical leader. It is a decision making process by which the leader makes the decision to break contact, assault, pursue by fire, or any other various actions. The Combat Estimate is beyond the scope of current course offerings at MVT and will be a part of a Small Unit Leaders course. However, a big part of how a good tactical leader communicates actions to his team or squad mates is through Implicit Communication also known as the “Fighter Leader” concept. Simply put it is leadership by example. But it is slightly more nuanced than the cliché suggests. Say everyone has conducted their RTR’s AND have gotten relatively online. If the team leader bounds forward, guess what? You are attacking. If the team leader bounds back, you are breaking contact. If he moves uncomfortably close to you (very little dispersion) he wants you to shift in that direction on your next bound. If he is moving too far away (too much dispersion), he wants you to shift towards him on your next bound. In this way, the tactical leader can convey how he wants his unit to react based on where he positions himself or how he bounds. Taking this a step further to the squad level, we add an element referred to as the “Base Element” in this case a team. The squad leader moves and his team moves with him. The other two team leaders base their movements and their respective team’s position according to the position and actions of the squad leader’s team. Obviously this means that the most effective way to do this, is by having the squad leader’s team in the middle. Your homestead was unsuccessfully raided at dawn. The attackers were beaten back without any loss of life or significant damage to the property. As it gets lighter your team moves out to conduct an assessment. You find several hastily prepared positions. Of note is one position with some very dark blood with green fluid in it. The old man says this indicates one of the raiders was gut shot, and the consensus is to see if you can find him. By the amount of blood, it doesn’t seem like he can get very far. Your team begins tracking the wounded individual. You notice two different types of tracks due to tread differences, one of which seems to be shuffling his feet. Someone was with him. About 300m away you find a spot where the enemy stopped for a time, attempting to dress the wound. There is a large pool of blood and some used bandages at the site. A set of prints moves off to the south and is leaving a consistent spotting of blood along the way. It seems the wounded individual is now alone. Crack, Crack, Crack… everyone RTR’s. The fire is continuous but seems to be coming from one position. Everyone is now online. The leader is 8 yards off to your left. He bounds forward, and his buddy joins him. They are alpha. An assault, payback time! You and your buddy (bravo pair) bound forward. This time when alpha bounds, instead of going forward of your pair, the team leader bounds to a position online with you and only two yards away. That’s too close. He’s getting in your lane. Oh sh*t! He wants me to push to the right on my next bound. You bound forward at an angle, and yell to your buddy “push right!” Alpha now bounds forward of you again, this time staying in their new lane. A shrill voice 20 yards ahead screams “Don’t shoot! I give up!”…. Since CTT and Combat Patrol focus instruction in becoming the “warrior” there is the component of leadership which is important, but outside the scope of these courses. Being a warrior is one thing. 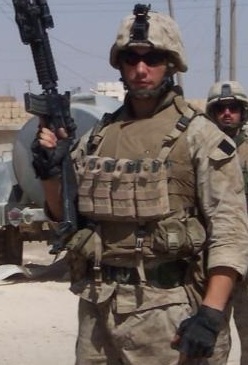 Leading a group of warriors in the heat of conflict is quite another. Long story short, the step that is not seen in CTT and Combat patrol is the step of a Combat Estimate, and that call is for a tactical leader to make, the one you have chosen to follow. You chose this person, and they decide if you go forward, pull back, peel etc when the bullets start flying. Now, remember that Team Integrity thing back at the beginning of this post? Yep… it’s pretty crucial. Max Adds: The full detail on the Combat Estimate process, explanation, with aide-memoire, is included in ‘Contact! 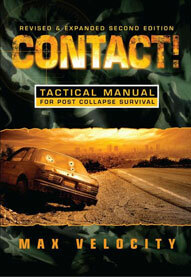 A Tactical Manual for Post-Collapse Survival.’ A full orders process is also included. The implicit teamwork, with the fighter-leader, is not going to work unless you have trained and drilled together, so that you know what you should be doing. You also need to have impicit trust and be willing to follow that leader. “Go left, go right, but make a decision” – or in your case, follow him in executing that decision. At CTT and CP classes, we go out and conduct deliberate drills, where we know whcih drill we are about to do, and it is explained that on a real patrol you should have briefed and rehearsed your ‘Actions On’ drill before patrol departure i.e. ‘Actions On Enemy Contact!’ That will give you an immediate knee-jerk plan should you encounter surprise contact, which aids in operant conditioning and helps move the individual and team through the initial freeze of unexpected enemy contact, particularly for the first time. But the realty is that every situation is different. Once you have all RTR’d and got roughly online, the team leader may take a different course of action, or that course of action may kick in after the break contact drill has already begun, due to unexpected enemy direction, multiple firing points or changed /newly identified enemy location, identification of new exit routes etc. So you have to be flexible, and ready to follow the leader. If we can’t immediately identify a way to get an advantage over your opponent and unless there is a specific reason why we would want or need to continue the attack it’s likely best to simply break contact. Here are two easily understood (Dear Lord, I hope they understand this before the shooting starts) reasons why: you don’t want to end up being fixed and have them maneuver on you, and your resources (men, materiel, etc.) are liable to be much more finite than that of your opponent. Fundamentally, it’s stupid to expend assets in what is likely to end up a draw. This is not meant to take away some of the more audacious plans that can arise upon completion of the OODA loop or as a result of the combat estimate referenced above, but is simply some advice for those who think they have everything figured out but have never really found themselves where the metal meets the meat. In case you aren’t aware, this sh*t is dangerous. Let me reiterate for those of you who who may not understand yet: friends or family of yours may DIE. It’s not liable to be the pretty or peaceful death you see or read about either. I guess to sum this up, look at this as a risk vs. reward. If I can’t get the advantage over someone else the best case scenario is that we risk our lives in order to shoot some bullets at bad guys. Not a good trade-off. With that said, if we can immediately identify and exploit an advantage over the enemy or if there is a specific reason why we must continue the engagement then our decision is already made. I think, you haven’t been to a CTT class, right? My target audience was the prospective small unit commander (fire team/squad leader) rather than the individual who is part of the unit. I went up one level. The article wasn’t wrong nor do I think it was completely right. I see what the author was getting at and it offers a workable solution. I applaud him for that. My take is that it shouldn’t be a mandatory thing to have one and only one buddy. Proper training and ingrained SOP’s should make folks interchangeable. To answer your question, no, I haven’t been to a CTT class neither do I feel any particular compunction to do so. Do you disagree with anything I have said, if so, why? Ok, I’ll publish this just before heading up on Combat Patrol class. A little short of time right now. Perhaps Lee will have time to chime in. Simply, it is not that you are right or wrong, but that you are inappropriately building off a post on a simple topic in an attempt to lecture, when if you were aware of MVT training you would know that we already consider andtake account of your points, and in a great deal more depth. You are inappropriately trying to utilize a post on simple basics as a springboard to lecture, on what you say is ‘going up one level’ but doesn’t appear to be. As a simple example, anyone familiar with MVT training would know that break contact drills are integral and advised as the default setting, unless your mission/situation is otherwise. If you deem my “lecture,” to be inappropriate than allow me to extend my apologies, no offense meant to you (or Lee.) Look, it’s your blog, I respect that and I respect that you put my post(s) up even if you didn’t like it. This was not an ego-feeding exercise for me. My point was to put some emphasis or re-emphasis (admittedly uninvited) on this topic for the casual reader or the person who wants to attend your training but for whatever reason is not able to do so. However, because I have an interest in the good guys remaining vertical and ventilating, I don’t want someone to think that reading some pages from a book or the web and imagining how it would be is going to make them Rifleman Dodd. War is still romantic for those who haven’t been a part of it. The quest to see the elephant exists to this day, hence, the break contact emphasis. Listen, I’ve read your blog. I’ve enjoyed it. I don’t intend to stop. Disagreements that I have with what you say are typically just an argument on cat-skinning. I like Ford, you prefer Chevy both carry the load. Whatever your particular experience, you would benefit from a CTT class. Everyone does. We all need to train. I flatly disagree with this article. Buddy teams get separated quite a bit during chaotic combat situations. This is why we have SOPs. A 4-man team should be able to bound in any random order. I think, partially the point of the article, was to provide an SOP to fix chaos resulting from react to contact. No? Well, yeah. It’s not a terrible idea. In fact, it’s ideal. What if it’s not feasible? Another drawback is the time lost executing these bounds which could be put toward breaking contact or attacking, as well as the substantial risk which results in merely getting back to square one. From an organizational perspective, people are always coming and going. In the Army, people get promoted, ETS, new kids arrive. In civ life priorities change, new people show up, injuries occur, or maybe so-and-so just can’t make it that weekend. Great piece on communication and team control. It’s definitely one of those things people need to get their hands dirty on for full understanding. The bounds referred to in the article were referring to a break contact drill.